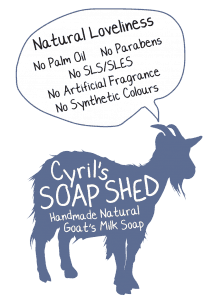 Goats milk soap from Cyril's Soap Shed. Handmade and natural. For hundreds of years, it has been believed that goats milk has exceptional moisturising and healing properties. It is a similar pH level to human skin, and is naturally high in vitamins, minerals and Alpha Hydroxy acids, that nourish and rejuvenate. Goats milk soap works particularly well for sufferers of eczema, psoriasis, and dry skin problems. Some dermatologists are now suggesting trying goats milk soap on problem skin, those with eczema, psoriasis and dry skin, before using 'conventional' products. Goats milk soaps are also excellent on normal skin, and can help prevent any problems. Our Goats Milk soaps are made using an ancient, traditional method known as the cold process. We mix quality, ethically sourced, natural oils with an alkali mixture, known as lye, which is made from the raw goats milk. Once all the ingredients are mixed, we pour the soap into handmade wooden moulds to set for 48 hours. The soap is then hand cut into individual bars and left to 'cure' for a minimum of three weeks, leaving a gentle and caring bar of soap, delicate enough for even the most sensitive of skin, and those prone to eczema, psoriasis and dry skin. All of our Goats Milk soaps are hand made from the start. Our soap is a natural tan colour, but we do use natural herbs (mostly grown in our own garden), and root powders to add gentle swirls of colour and texture to our soaps. 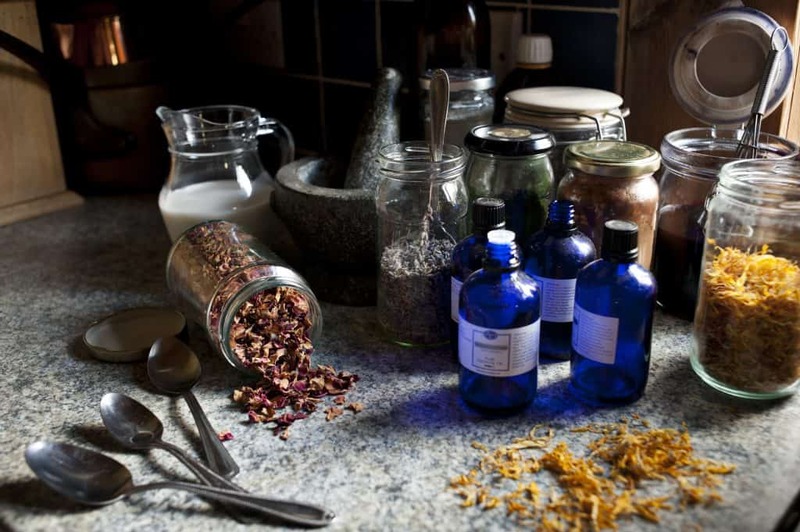 All of the fragrances we use are just pure Essential Oils. There are no harsh chemicals like sodium lauryl sulphate. Just 100% pure, natural ingredients. We don't use Palm Oil in our Goats Milk Soaps. All of our soaps are suitable for vegetarians.